The Daily Show with Jon Stewart, December 7, 2011, The Senate passes a bill that jeopardizes Americans' civil rights. The NDAA would vastly enhance government powers, creating the authority to detain indefinitely without trial. Mere accusation would be enough to deny freedom to law-abiding people. Rather than face FBI harassment, those activists — and any others raising awareness about issues like foreign policy or corporate environmental policies — could face the American equivalent of a gulag. The National Defense Authorization Act allows, among other things, the military to detain American citizens indefinitely, to conduct secret kidnappings of suspected terror suspects (even if they are Americans living on American soil), and murder of same if said suspect is deemed a threat to national security. All without a trial. All without any deference to any other constitutional protection. In the video above, Ron Paul describes the National Defense Authorization Act as a slip into tyranny that virtually guarantees our descent into totalitarianism. Two protesting the loss of freedom brought about by the passage of the NDAA are promptly arrested and whisked out of public sight. Holder said the language of the NDAA had been moved in a "substantial way" from some of the original language which led the president to issue a veto threat. "So we are in a better place, I think the regulations, procedures that will help, and we’ll also have a signing statement from the president" which will help clarify how they view the law, Holder said. This type of “stroke of the pen, law of the land” despotism is nothing new to President Obama. More on that in a moment. In the present case, the President’s original opposition to the NDAA had nothing to do with preserving liberty, but with preserving the President’s preeminence in matters relating to who has the final say on the tracking and torturing of those suspected of threatening the security of the homeland. It is likely, therefore, that President Obama’s signing statement will give the Federal Bureau of Investigation plenary power over the disposition of issues related to the custody and prosecution of all terror suspects detained domestically. The Obama administration warned earlier that cutting out the FBI would reduce the overall effectiveness of investigations, as well as hamstring the efforts of intelligence officers to gather reliable intel from those believed to be fighting against the United States in Afghanistan or Iraq. That will undoubtedly be prevented in the terms of his unconstitutional interpretations tacked onto the NDAA. The bottom line is, the President was just satisfied enough with the acquiescence of congress to let the bill get to his desk, but he wants to make sure everyone knows (especially the legislative branch) just who is the arbiter of who is and is not an “enemy combatant” and just how “critical intelligence” will be wrung from those suspects and by whom. Interestingly, during his campaign for President in 2008, Barack Obama criticized (and rightly so) former President Bush for his dictatorial usurpation of legislative power via the signing statement. Upon ascending to his seat of power, however, President Obama found that his own personal experience with the mounting congressional resistance to his agenda has given him second thoughts, and now he is as keen as his predecessor to sidestep congressional impediments to the achievement of his legislative goals by using executive orders and signing statements. A presidential signing statement is a pronouncement that the President appends to a bill he signs into law. Nowadays, this executive addendum sets forth the President’s understanding of the law and gives guidance to the myriad departments under the executive branch umbrella on how to carry out the requirements of the new legislation. Signing statements change the laws, revoking parts of them or adding provisions to them, at the same time redefining the Constitution and nullifying its checks and balances. Using them, the President assumes all power — executive, legislative, and judicial — unto himself and does so in a manner that is beyond question, beyond debate, beyond vote, and thus beyond the reach of the American people. Constitutionally speaking, if a President does not like a piece of legislation, the only recourse allowed him is a veto. Modern Presidents, however, have two self-perpetuating habits that obviate the use of veto: engorging themselves with power not delegated to them by the Constitution and disregarding the Constitution altogether. Given the recent run of success that previous Presidents have enjoyed with the “signing statement as law of the land” gambit, it is easy to understand why a President zealous for the codification of his own vision would not want to risk the public scrutiny which would accompany a veto. After all, why go to all that bother when a President can accomplish the same end by issuing a signing statement that will never be discussed? President Obama has learned well the lessons taught him by his hero and founder of the modern American welfare state, Franklin Delano Roosevelt. In addition to this edict, Roosevelt promised Congress that if it did not remove the “offensive” portion of the bill, he would ignore it and treat it as nonexistent and inapplicable to his administration. Congress capitulated, and the protection for American farmers was removed from the bill. Signing statements gained teeth with the aid of a lackluster, inattentive Supreme Court. In the case of United States v. Lovett (1946), the Court agreed with Roosevelt's signing statement that the Urgency Deficiency Appropriations Act of 1943 contained restrictions on his management of the executive branch and struck down the restrictions citing the signing statement; the Court accepted Roosevelt’s signing statements as persuasive and held in dictum that presidential signing statements merited consideration and mention in their decision. Presidential signing statements amount to “cherry-picking” the parts of a law that Presidents wish to follow or ignore. The uses that signing statements have been put to since they began to flourish in earnest during the Reagan administration show that no matter the “getting things done” tenor used to pronounce them by an ostensibly frustrated President, their clear intent is to subvert the law and slam the weighty wrecking ball of “executive discretion” into the paper barricades that divide the three provinces of power. With all due respect to Attorney General Holder and his boss in the White House, ruling by fiat is not historically sound, and another more appropriate focus of historical research would be to ponder the words and warnings of our Founding Fathers and their political and philosophical influences regarding the primacy of the separation of powers in a good government. "The accumulation of all powers legislative, executive and judiciary in the same hands, whether of one, a few or many, and whether hereditary, self appointed, or elective, may justly be pronounced the very definition of tyranny." Madison himself was restating in his inimitable style, one facet of federalism that was universally considered to be an essential pillar of liberty. If the opinions of these men are a worthy metric of the size of the impending threat of despotism, then President Obama is filling the shoes of a tyrant heel to toe. His latest decision to unilaterally demolish the walls of history, law, and constitutional barriers that separate the executive and legislative powers demonstrates his intent to persist down the path of despotism by decree so well trodden by many of his forerunners. The Obama administration on Monday plans to outline how U.S. laws empower the government to kill Americans overseas who engage in terrorism against their home country, a source familiar with the matter said, months after a drone strike killed a U.S.-born cleric who plotted attacks from Yemen. Civil liberties groups have been pressuring the administration to offer justification for what has been described as a top-secret "targeted kill" program in which Americans who have joined al Qaeda or other militants are deemed legitimate targets to be killed overseas. U.S. officials have refused to talk much publicly about the program but some officials said last year that Americans like Awlaki could be placed on a kill or capture list by a secretive panel of senior U.S. government officials which then informs the president of its decisions.Holder will likely couple the justification with another argument that the administration has repeatedly made about terrorism: both traditional criminal courts and military tribunals work to prosecute terrorism suspects, the source said. Defense Department lawyer Jeh Johnson last month referred to the so-called "targeted kill" program, saying that it pursued legitimate military targets overseas and rejected suggestions that the United States was engaged in assassination. "Under well-settled legal principles, lethal force against a valid military objective, in an armed conflict, is consistent with the law of war and does not, by definition, constitute an 'assassination,'" Johnson said at Yale Law School. The American Civil Liberties Union on February 1 sued the Obama administration in federal court, demanding that Holder's Justice Department release what it believes are legal memoranda justifying targeting Americans overseas using lethal force. The Obama administration has run into difficulties trying to prosecute terrorism suspects in the U.S. court system, facing criticism over giving terrorism suspects full legal rights and whether they addressed security for the trials sufficiently. Republicans in Congress and even some of Obama's fellow Democrats have demanded that they be tried in military tribunals and blocked moving terrorism suspects from the military prison at Guantanamo Bay, Cuba, to the federal prison system. After deliberately lobbying for the inclusion of provisions that summon Americans to indefinite detention without trial or due process, Liar-in-Chief Barack Obama has issued a meaningless Presidential Policy Directive (PPD) that supposedly now exempts Americans from the egregious and unconstitutional provisions of his National Defense Authorization Act (NDAA) during the 2012 fiscal year. InfoWars‘ Paul Joseph Watson reports that the White House has issued a new “Fact Sheet” on this directive outlining how Section 1022 of the NDAA, which deals with the indefinite detention of suspected “terrorists” by the U.S. military, will not necessarily apply to “U.S. lawful permanent residents” who are arrested in the U.S. under certain circumstances. But this PPD is not law and it is not permanent, as it only expresses the procedures that are to take place during 2012. It also states that the procedures “do not apply to any individuals held in the custody of the Department of Defense, state and local law enforcement agencies acting under their authorities, or a foreign government,” which basically asserts that the illegal detention provisions of the NDAA still do apply to all Americans. This political stunt is likely just an attempt to quell public outcry against the administration’s blatant betrayal of the U.S. Constitution. But the reality of the matter is that it really does nothing to reverse the NDAA’s authoritarian provisions concerning the illegal arrest and detention of Americans without due process. Since Obama’s PPD only applies to 2012, the next occupier of the White House will have full reign to utilize the arsenal of government control tactics contained in the NDAA. And since Obama’s recent PPD “amendment” was birthed out of an apparent whim to begin with, it could just as easily be revoked should Obama suddenly change his mind again. It is important to note that former Republican presidential candidate John McCain of Arizona, as well as Sens. Lindsey Graham (R-S.C.) and Kelly Ayotte (R-N.H.) have all indicated their opposition to the PPD. Each of these traitors openly supports the illegal and indefinite detention of Americans deemed to be potential “terrorists,” and are working to have the PPD revoked. As with an executive order, a presidential directive would not lose its legal effectiveness upon a change of administration. Rather, in our view, because a presidential directive issues from the Office of the Chief Executive, it would remain in force, unless otherwise specified, pending any future presidential action. Skeptics fear the president will lift the directive and still incarcerate US citizens under NDAA. Despite the fact that it was his administration that specifically demanded the controversial ‘indefinite detention’ provisions of the NDAA be applied to Americans, President Obama has issued a ‘Presidential Policy Directive’ that forbids the law from being used against US citizens. A “fact sheet” released by the White House last night contains details of a “Presidential Policy Directive” which explains that the administration will not seek to use the so-called ‘kidnapping provision’ of the National Defense Authorization Act to incarcerate American citizens without trial. “Section 1022 does not apply to U.S. citizens, and the President has decided to waive its application to lawful permanent residents arrested in the United States,” states the White House fact sheet (PDF). Obama’s PDD contains a number of other circumstances in which people would be exempt from indefinite detention, but the language concerning American citizens states that to be exempt, a US citizen must be “arrested in this country or arrested by a federal agency on the basis of conduct taking place in this country,” meaning Americans arrested abroad could still be kidnapped and held without trial. There’s no doubt that this represents a victory for civil libertarians on both sides of the political spectrum, but skeptics will be keen to stress that just because the Obama administration, which could be out of office by this time next year, has indicated it will not indefinitely detain Americans under the NDAA, doesn’t necessarily mean that future administrations will also refrain from doing so. Indeed, if the administration was so concerned about the indefinite detention provisions, why did it specifically lobby for them to be applied to American citizens in the first place? As we documented at the time, shortly before the bill was signed into law, Senator Carl Levin revealed that it was the administration which demanded the removal of language that would have protected Americans from the ‘kidnapping’ provisions of the NDAA. Don’t expect Obama’s PDD to be the end of the matter. Senators John McCain (Ariz.), Lindsey Graham (S.C.) and Kelly Ayotte (N.H.) have already indicated that they will argue against exempting American citizens from indefinite detention. In issuing the policy directive, Obama is attempting to head off a potential states’ rights rebellion against the federal government. With Virginia already having passed a bill in the House and Senate that nullifies the indefinite detention provisions of the NDAA, Utah has introduced a resolution with the ultimate intention of doing the same, along with several other states. Rumors have been floating around the internet for the past week or so that Obama signed NDAA into law before Christmas. Well, he didn't. But that doesn't really matter now, because today he did. In case you haven't heard, H.R. 1540: National Defense Authorization Act for Fiscal Year 2012 or NDAA, is not your typical defense spending bill. It gives authority to the president (or perhaps it'd be more fitting to call him king or ruler at this point) to order the military to indefinitely detain U.S. citizens without official charge or trial on the mere suspicion of being a terrorist or linked to a terrorist organization. The citizens of our country that understand what happened when Obama lifted his pen off the dotted line (while in Hawaii) wonder why their elected representatives don't remotely represent them or stand up for the Constitution as they swear to do. In a previous article I pointed out that the U.S. senators from Utah were divided in their vote on this bill. Senator Orrin Hatch voted for NDAA, while Senator Mike Lee was one of only seven senators in the country that voted against it. 68 percent of the House voted in favor, and only one of three U.S. congressmen from Utah earned his title of "representative" by voting against the bill: Rep. Jason Chaffetz. We're well down a dangerous path, here -- trying to preserve our safety by trading away what makes us American. Being "suspected" of having connections to terrorism is not justification for removing our right to due process. Some people I respect voted for this, but I'm afraid I strongly feel that this is a really bad bill. Little by little, in the name of fighting terrorism, our Bill of Rights is being repealed...The Patriot Act, as bad as its violation of the 4th Amendment, was just one step down the slippery slope. The recently passed (NDAA) continues that slip toward tyranny and in fact accelerates it significantly. The main section of concern, Section 1021 of the NDAA Conference Report, does to the 5th Amendment what the PATRIOT Act does to the 4th. The 5th Amendment is about much more than the right to remain silent in the face of government questioning. It contains very basic and very critical stipulations about due process of law. The government cannot imprison a person for no reason and with no evidence presented or access to legal counsel. How closely associated? And what constitutes "substantial" support? What if it was discovered that someone who committed a terrorist act was once involved with a charity? Or supported a political candidate? Are all donors of that charity or supporters of that candidate now suspect, and subject to indefinite detainment? Is that charity now an associated force? It should be painfully obvious to Americans by now that if they continue to vote for the status quo, no matter if it's Republican or Democrat, then the attack on civil liberties and the dismantling of the Constitution will inevitably continue. So raise your glasses to toast the new year. It's not even midnight, and your right to due process has already been taken away. What's next? Though the 9/11 attacks occurred more than a decade ago, Congress continues to exploit them to pass evermore draconian laws on “terrorism,” with the Senate now empowering the military to arrest people on U.S. soil and hold them without trial, a serious threat to American liberties, says ex-CIA analyst Ray McGovern. President Barack Obama signed a wide-ranging defense bill into law Saturday despite having "serious reservations" about provisions that regulate the detention, interrogation and prosecution of suspected terrorists. For example, FBI Director Robert Mueller has said the measure would inhibit his bureau's ability to persuade suspected terrorists to cooperate immediately and provide critical intelligence. He told Congress it wasn't clear how agents should operate if they arrest someone covered by the military custody requirement but the nearest military facility is hundreds of miles (kilometers) away. Other officials have said agents and prosecutors should not have to spend their time worrying about citizenship status and whether to get a waiver while trying to thwart a terror attack. The penalties do not go into effect for six months. The president can waive them for national security reasons or if the country with jurisdiction over the foreign financial institution has significantly reduced its purchases of Iranian oil. This week, in response to the threatened penalties, Iran warned that it may disrupt traffic in the Strait of Hormuz — a vital Persian Gulf waterway. But on Saturday, Tehran seemed to back off that threat when a commander of its Revolutionary Guard, Gen. Masoud Jazayeri, said such discussion is a thing of the past and "belongs to five years ago." He said Iran had other, unspecified strategies for reacting to any Western aggression. If Congress does not pass a Department of Defense Authorization bill that Obama will sign by the end of the year, almost all of the U.S. military’s activities around the world would be jeopardized. At this point, the House and Senate have both passed their versions of the bill (H.R.1540 and S.1867), but they have disagreement on several provisions, including a provision opposed by the Obama Administration that would require the military to indefinitely detain terrorism suspects, including American citizens living in the U.S., without charge or trial. With the House having voted 406-17 to “close” portions of the meetings and avoid public scrutiny, members from both chambers and both parties are meeting in a secretive conference committee to work on reconciling the differences between the House and Senate versions of the bill. On the military detention provision, their main task is going to be to find a solution that can pass both chambers (again) and not draw a veto from President Obama. Contrary to popular perception, the Obama Administration is not strongly opposed to the provisions in the bills that would authorize indefinite military detentions for U.S. citizens. Section 1031 attempts to expressly codify the detention authority that exists under the Authorization for Use of Military Force (Public Law 107-40) (the “AUMF”). The authorities granted by the AUMF, including the detention authority, are essential to our ability to protect the American people from the threat posed by al-Qa’ida and its associated forces, and have enabled us to confront the full range of threats this country faces from those organizations and individuals. Because the authorities codified in this section already exist, the Administration does not believe codification is necessary and poses some risk. After a decade of settled jurisprudence on detention authority, Congress must be careful not to open a whole new series of legal questions that will distract from our efforts to protect the country. While the current language minimizes many of those risks, future legislative action must ensure that the codification in statute of express military detention authority does not carry unintended consequences that could compromise our ability to protect the American people. The Administration strongly objects to the military custody provision of section 1032, which would appear to mandate military custody for a certain class of terrorism suspects. As you can read for yourself here, Section 1031, affirming the “authority of the armed forces of the United States to detain covered persons…” does not contain an exemption for U.S. citizens. Section 1032, mandating the military detention authority be used for terrorism suspects, does, but that is the section that the Obama Administration says must be removed or else he will veto. The Administration has been stressing the need for flexibility in their powers to collect information and incapacitate terrorists, which likely means that they want to retain the power to detain suspects outside the context of war and the Geneva Convention protections that would apply. The secretive conference committee may still be able to overcome Obama’s veto threat while also codifying the power to indefinitely detain U.S. citizens without having to charge them or give them a trial. I – like everyone else – am horrified by the Senate’s passage of legislation that would allow for indefinite detention of Americans. And at first, I – like many others – assumed that Obama’s threat to veto the bill might be a good thing. But the truth is much more disturbing. In other words, the regime is saying that, under AUMF, the executive branch has total discretion as to who it detains and how it treats detainees. Moreover, as the executive branch has total discretion, no one can find out what the executive branch is doing, who detainees are, or what is being done to them. Codification brings accountability, and the executive branch does not want accountability. Even if Obama’s threatened veto was for more noble purposes, the fact is that it would not change anything, because the U.S. government claimed the power to indefinitely detain and assassinate American citizens years ago. Anyone who donates money to a charity that turns up on Bush’s list of “terrorist” organizations, or who speaks out against the government’s policies could bedeclared an “unlawful enemy combatant” and imprisoned indefinitely. That includes American citizens. Glenn Greenwald and Fire Dog Lake’s Emptywheel have also documented that the White House has believed for many years that it possessed the power to indefinitely detain Americans. See this, this, this, and this. The police state started in 2001. On that same day, a national state of emergency was declared … and that state of emergency has continuously been in effect up to today. The Obama administration has also said for more than a year and a half it could target American citizens for assassination without any trial or due process. On September 17, 2001, George W. Bush signed an executive order authorizing the use of “lethal measures” against anyone in the world whom he or his minions designatedan “enemy combatant.” This order remains in force today. No judicial evidence, no hearing, no charges are required for these killings; no law, no border, no oversight restrains them. Bush has also given agents in the field carte blanche to designate “enemies” on their own initiative and kill them as they see fit. The existence of this universal death squad – and the total obliteration of human liberty it represents – has not provoked so much as a crumb, an atom, a quantum particle of controversy in the American Establishment, although it’s no secret. The executive order was first bruited in the Washington Post in October 2001 …. The New York Times added further details in December 2002. That same month, Bush officials made clear that the dread edict also applied to American citizens, as the Associated Press reported. The first officially confirmed use of this power was the killing of an American citizen in Yemen by a CIA drone missile on November 3, 2002. A similar strike occurred in Pakistan this month, when a CIA missile destroyed a house and purportedly killed Abu Hamza Rabia, a suspected al Qaeda figure. But the only bodies found at the site were those of two children, the houseowner’s son and nephew, Reuters reports. The grieving father denied any connection to terrorism. An earlier CIA strike on another house missed Rabia but killed his wife and children, Pakistani officials reported. It’s hard to believe that any genuine democracy would accept a claim by its leader that he could have anyone killed simply by labeling them an “enemy.” It’s hard to believe that any adult with even the slightest knowledge of history or human nature could countenance such unlimited, arbitrary power, knowing the evil it is bound to produce. Yet this is what the great and good in America have done. Like the boyars of old, they not only countenance but celebrate their enslavement to the ruler. Bush proudly held up this hideous system as an example of what he called “the meaning of American justice.” And the assembled legislators…applauded. Oh, how they applauded! Ignoring a presidential veto threat, the Democratic-controlled Senate on Thursday overwhelmingly approved a massive, $662 billion defense bill that would require the military to hold suspected terrorists linked to al-Qaida or its affiliates, even those captured on U.S. soil, and detain some indefinitely. The vote was 93-7 for the bill authorizing money for military personnel, weapons systems, national security programs in the Energy Department, and the wars in Iraq and Afghanistan in the fiscal year that began Oct. 1. Reflecting a period of austerity and a winding down of decade-old conflicts, the bill is $27 billion less than what President Barack Obama requested and $43 billion less than what Congress gave the Pentagon this year. Shortly before final passage, the Senate unanimously backed crippling sanctions on Iran as fears about Tehran developing a nuclear weapon outweighed concerns about driving up oil prices that would hit economically strapped Americans at the gas pump. The vote was 100-0. "Iran's actions are unacceptable and pose a danger to the United States and the entire world," Senate Majority Leader Harry Reid, D-Nev., said. "Iran supports terrorist groups, arms the killers of American soldiers, lies about its nuclear program, violates its citizens' basic rights and threatens Israel's security." The Senate's version of the defense bill still must be reconciled with the House-passed measure in the final weeks of the congressional session. In an escalating fight with the White House, the bill would ramp up the role of the military in handling terror suspects. Defense Secretary Leon Panetta and FBI Director Robert Mueller both oppose the provisions as does the White House, which said it cannot accept any legislation that "challenges or constrains the president's authorities to collect intelligence, incapacitate dangerous terrorists and protect the nation." Late Thursday, a White House official said the veto threat still stands. The bill would require military custody of a suspect deemed to be a member of al-Qaida or its affiliates and involved in plotting or committing attacks on the United States. American citizens would be exempt. The bill does allow the executive branch to waive the authority based on national security and hold a suspect in civilian custody. The legislation also would deny suspected terrorists, even U.S. citizens seized within the nation's borders, the right to trial and subject them to indefinite detention. Senate Intelligence Committee Chairman Dianne Feinstein, D-Calif., had sought an exception to the provision for U.S. citizens, but her effort failed, 55-45. Lengthy negotiations produced a face-saving move that the Senate backed 99-1, a measure that said nothing in the bill changes current law relating to the detention of U.S. citizens and legal aliens. Senate Armed Services Committee Chairman Carl Levin, D-Mich., repeatedly pointed out that the June 2004 Supreme Court decision in Hamdi v. Rumsfeld said U.S. citizens can be detained indefinitely. The series of detention provisions challenges citizens' rights under the Constitution, tests the boundaries of executive and legislative branch authority and sets up a showdown with the Democratic commander in chief. Civil rights groups fiercely oppose the bill. "Since the bill puts military detention authority on steroids and makes it permanent, American citizens and others are at greater risk of being locked away by the military without charge or trial if this bill becomes law," said Christopher Anders, senior legislative counsel for the American Civil Liberties Union. The bill reflects the politically charged dispute over whether to treat suspected terrorists as prisoners of war or criminals. The administration insists that the military, law enforcement and intelligence agents need flexibility in prosecuting the war on terror after they've succeeded in killing Osama bin Laden and Anwar al-Awlaki. Republicans counter that their efforts are necessary to respond to an evolving, post-Sept. 11 threat, and that Obama has failed to produce a consistent policy on handling terror suspects. The Senate rejected an effort by Feinstein to limit a military custody requirement for suspects to those captured outside the United States. The vote was 55-45. Feinstein said her goal was to ensure "the military won't be roaming our streets looking for suspected terrorists." The issue divided Democrats, with nine senators, many facing re-election next year, breaking with their leadership and administration to vote against the amendment. Republicans held firm, with only Sens. Rand Paul of Kentucky, Mark Kirk of Illinois and Mike Lee of Utah backing Feinstein's effort. "We need the authority to hold those individuals in military custody so we aren't reading them Miranda rights," Sen. Kelly Ayotte, R-N.H., said in defense of the legislation. Last week, the administration announced a new set of penalties against Iran, including identifying for the first time Iran's entire banking sector as a "primary money laundering concern." This requires increased monitoring by U.S. banks to ensure that they and their foreign affiliates avoid dealing with Iranian financial institutions. But lawmakers pressed ahead with even tougher penalties despite reservations by the administration. Sens. Bob Menendez, D-N.J., and Kirk had widespread bipartisan support for their amendment that would target foreign financial institutions that do business with the Central Bank of Iran, barring them from opening or maintaining correspondent operations in the United States. It would apply to foreign central banks only for transactions that involve the sale or purchase of petroleum or petroleum products. The sanctions on petroleum would only apply if the president determines there is a sufficient alternative supply and if the country with jurisdiction over the financial institution has not significantly reduced its purchases of Iranian oil. Testifying before the Senate Foreign Relations Committee, David Cohen, a senior Treasury Department official, and Wendy Sherman, an undersecretary of state, warned that the amendment could force up oil prices — a financial boon for Iran. "There is absolutely a risk that in fact the price of oil would go up, which would mean that Iran would in fact have more money to fuel its nuclear ambitions, not less," Sherman said. "And our real objective here is to cut off the economic means that Iran has for its nuclear program." Cohen said the amendment would tell foreign banks and companies "that if they continue to process oil transactions with the Central Bank of Iran their access to the United States can be terminated." "It is a very, very powerful threat," Cohen warned. "It is a threat for the commercial banks to end their ability to transact in the dollar and their ability really to function as major international financial institutions," and one that could push allies away from contributing to a coordinated effort against Iran. A sinister bill has quietly been introduced, so expansive in scope and dangerous in nature that it makes the PATRIOT Act look like the Bill of Rights. This bill, the National Defense Authorization Act (NDAA) for Fiscal Year 2012, or S. 1253, has received tragically sparse coverage, and I must admit that I was not aware of it until a reader emailed me about it. If you think the PATRIOT Act is bad, just wait until you check out sections 1031, 1032, 1033, and 1036 of this horrific bill. The American Civil Liberties Union (ACLU) wrote a letter to the Senate Judiciary Committee on July 1st of this year, addressed to the Chairman of the Committee, the “Honorable” Patrick Leahy, and Ranking Member of the Committee, the “Honorable” Charles Grassley who strongly decried the bill. If these provisions are enacted, it would give the federal government the explicit power to imprison civilians, including American citizens, indefinitely with no charges or trial. This would include individuals apprehended both inside and outside of the United States, meaning that this could give the federal government the ability to openly detain American citizens for their entire lives without so much as a single charge. While the federal government already murders American citizens abroad based upon the decision of an unlegislated secret death panel within the National Security Council, this would be the first time since 1950 that Congress has explicitly authorized indefinite detention of Americans without charges or a trial. This provision includes people who had absolutely no role in the attacks of September 11th, 2001, or any hostilities whatsoever and would mandate military detention of certain civilians. This includes civilians arrested within the United States who would otherwise be outside of military control while also transferring all responsibilities to the Department of Defense. Instead of the Department of Justice’s Criminal Division, National Security Division, or the United States Attorneys, the Federal Bureau of Investigation, the Bureau of Prisons, the Marshals Service and/or the state attorneys general handling the prosecutorial, investigative, law enforcement, penal and custodial authority, the Department of Defense would handle it all. That means that all control would be taken out of the hands of civilians and put into the brutal grip of the American military, essentially meaning a military takeover of our so-called justice system. All they would have to do is classify you as a terrorist, no need for actual charges or participation in hostilities; you could be locked up indefinitely for any reason or no reason at all if the Department of Defense saw fit under this NDAA. These provisions of the NDAA are so radical that they actually remove much of the protections American citizens have had since 1878 under the Posse Comitatus Act and the Non-Detention Act of 1971. Section 1031 of S. 1253 would be the first time in more than 60 years that our so-called representatives in Washington would allow indefinite detention of American citizens with no charges or trial without Congressional authorization. Since 1971 the Non-Detention Act has stipulated, “No citizen shall be imprisoned or otherwise detained by the United States except pursuant to an Act of Congress,” but S. 1253 could make this a thing of the past. The ACLU points out that while Subsection 1031(c) of S. 1253 claims that it does not apply to lawful residents of the United States or citizens “on the basis of conduct taking place within the United States except to the extent permitted by the Constitution,” glaring loopholes remain. If the government’s track record is any indicator, we can expect these loopholes to be exploited at every possible opportunity. Just as the federal government has used the PATRIOT Act’s so-called “Sneak-and-Peek,” or delayed notice, warrants for over 1,600 drug cases and only 15 cases of terrorism in 2006-2009, we can expect the government to use S. 1253 for detaining people for completely illegitimate reasons. These loopholes allow suspects to be imprisoned without charge or trial, especially citizens or lawful residents who are suspected of some sort of wrongdoing outside of the United States. This, just like the unlegislated death panel that resulted in the killing of Anwar al-Awlaki and his 16-year-old son, leaves it up to the Executive without any guidelines whatsoever. It is quite shocking how much the federal government is attempting to push us towards a dictatorship with no legal protection whatsoever from being locked up with no hope of a fair trial or even charges. Indeed the legislation would allow American citizens to be imprisoned “until the end of hostilities” under 2001's Authorization for Use of Military Force, or S.J. Res. 23. Yet this represents no concrete timeframe whatsoever, and Section 1031 would allow American citizens and non-citizen civilians who had no role in 9/11 or any other hostilities whatsoever to be detained who would otherwise not be detainable under the laws of war. Section 1032 puts civilians who would otherwise not be subject to military control into military detention, thus removing the protections of the Posse Comitatus act. Like Section 1031, this would include indefinite imprisonment of civilians apprehended inside of the United States. Section 1032 does not authorize the military to detain civilians without charge or trial -- it in fact it mandates it. Previously the state and local law enforcement agencies and the Department of Justice had the primary responsibility to enforce anti-terrorism laws within the United States. The NDAA would, in the case of many civilian suspects, remove federal state and local law enforcement from the process of investigation, arrest, criminal prosecution and imprisonment and hand said powers over to the military. The ACLU “strongly urges” the Senate’s Judiciary Committee to conduct hearings on sections 1031, 1032, and 1036 and assert their jurisdiction to mark up these sections before the NDAA makes it to the Senate floor. They say that the Judiciary Committee should assert their jurisdiction over these provisions in order to prevent civilian law enforcement against civilians who would otherwise be out of the purview of the military to fall into the hands of the military. The ACLU’s letter does not, however, cover Section 1033 which Human Rights Watch claims would apply to the many detainees already being held for years without trial who have been cleared for release. I highly recommend that you send out this form letter along with a note written by yourself to all of your supposed representatives, along with as many phone calls as you can afford to make it clear that you do not support the United States being turned into a total militarized police state. While we are already in dire straits in terms of civil rights in this country, codifying indefinite military detention into law is one of the most dangerous developments since the introduction of the PATRIOT Act. If you even remotely care about the principles of freedom, liberty and justice which this nation is supposed to stand for, you will do us all a favor and stand up against this wholly unacceptable legislation that could represent the end of America as we know it. Madison Ruppert is the Editor and Owner-Operator of the alternative news and analysis database End The Lie and has no affiliation with any NGO, political party, economic school, or other organization/cause. He is available for podcast and radio interviews. If you have questions, comments, or corrections feel free to contact him at admin@EndtheLie.com. For the record, I said months ago that I did NOT believe that there was a REAL plan to round up American/US citizens and put us into "FEMA camps"... being that I am from the "show me state" of missouri.. I felt this claim required more proof that what was offered months/years ago. Now, the tables have turned, and I surely / sorely stand corrected. Also this very same short period of days, this week, KBR (security corporation which handles FEMA emergency camps) put out a call to staff these FEMA camps.. and to be ready on a 72 hour notice. Take these two events together.. same week... FEMA camps being alerted to staff on a short notice, and the US military authorized to arrest people at the drop of a hat. Here is the general link to Alex Jones / Infowars -- who has been staying on top of this issue.. (I know a lot of people thumb their nose at AJ -- but this is just one of MANY news outlets covering this issue -- just search on google s.1867 or KBR FEMA if you don't like Alex Jones or agree with his other work). This issue transcends "personalities"... we need to put any differences aside and deal with this together in unison! However, there are plenty of completely public Homeland Security and FEMA documents detailing parts of the secretive COG plans for a national emergency. Among these is the document we covered earlier, as this document reveals not only detailed aspects of the COG personnel relocation plans and martial law takeover of communications, but a plan to militarily-target Americans and designate them as enemy combatants – dramatically, through a blue/red high-tech surveillance matrix aimed at suppressing dissidents and occupying the homeland. The important clip above also documents numerous executive orders specifying a takeover of civil America. FEMA, and its overlord mother the Department of Homeland Security, have been given enormous powers, and are now beginning to use them. That’s why this new document is compelling enough for the government to cover up. FEMA camps are being staffed for stand-by operation – that’s what the recent KBR documents covered by Infowars.com show. Why don’t they want you to know? What HAS been exposed publicly points directly to overt takeovers of the constitutional government via martial law, the use of troops on the street (in violation of Posse Comitatus) and a definitive takeover of all communications, including the establishment of secure emergency communications lines for the the Continuity of Government controllers. More to the point, it validates the worst of fears – that rhetoric issued from political leaders in America demonizing its people as potential terrorists relates to real plans, albeit obscured from popular public knowledge, to target and indefinitely detain dissidents and other ordinary citizens any during declared emergencies, or for any pretext of national security. The job is similar to one offered by the Army National Guard. We covered it in July of 2009. Following our original post, the Army National Guard removed the job posting from its website. Another unsettling sign post has cropped up in the wake of the Senate’s passage of the National Defense Authorization Act (NDAA), as the Army has now reportedly designated a special prison guard unit for securing ‘civilian detainees.’ A similar job posting was advertised under the National Guard in 2009, which Infowars reported on at the time. 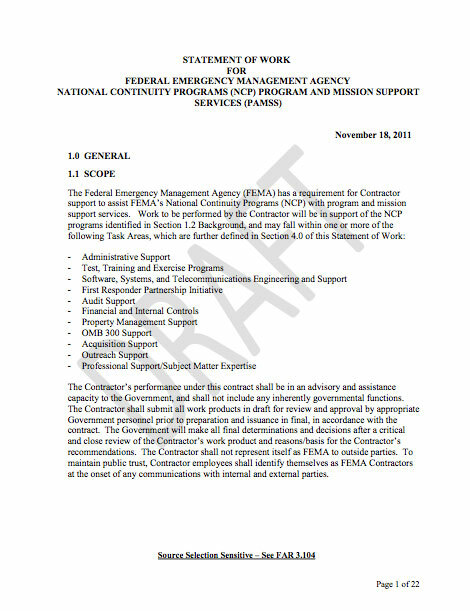 Only days ago, leaked documents from inside KBR, a Halliburton subsidiary, announced the activation of FEMA camps, with calls to staff a wide array of services inside the temporary emergency facilities. 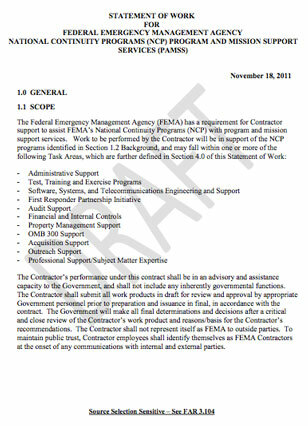 Infowars.com has received a document originating from Halliburton subsidiary KBR that provides details on a push to outfit FEMA and U.S. Army camps around the United States. Entitled “Project Overview and Anticipated Project Requirements,” the document describes services KBR is looking to farm out to subcontractors. The document was passed on to us by a state government employee who wishes to remain anonymous for obvious reasons. KBR’s call for FEMA camp service bids arrives soon after the Senate overwhelmingly passed the National Defense Authorization Act (NDAA), which permits the military to detain and interrogate supposed domestic terror suspects in violation of the Fourth Amendment and Posse Comitatus. A number of civil liberties groups have come out in strong opposition to the legislation, most notably the Japanese American Citizens League (JACL), the nation’s oldest and largest Asian American civil and human rights organization. The regions indicated in the KBR document. Soon after KBR’s announcement, a little-known Army document surfaced. Entitled the “Civilian Inmate Labor Program,” the unclassified document describes in detail Army Regulation 210-35. The regulation, first drafted in 1997, underwent a “rapid act revision” in January 2005 and now provides a policy for the creation of labor programs and prison camps on Army installations. In 2009, the National Emergency Centers Act or HR 645 was introduced in Congress. It mandates the establishment of “national emergency centers” to be located on military installations for the purpose of providing “temporary housing, medical, and humanitarian assistance to individuals and families dislocated due to an emergency or major disaster,” according to the bill. In addition to emergencies, the legislation is designed to “meet other appropriate needs, as determined by the Secretary of Homeland Security,” an open ended mandate which many fear could mean the forced detention of American citizens in the event of widespread rioting after a national emergency or total economic collapse, as Paul Joseph Watson noted in January of 2009. Rex 84 was devised by Col. Oliver North, who was with the NSC and appointed liaison to FEMA. John Brinkerhoff, the deputy director of “national preparedness” programs for FEMA, and North designed the plan on a 1970 report written by FEMA chief Louis Giuffrida, at the Army War College, which proposed the detention of up to 21 million “American Negroes” in the event of a black militant uprising in the United States. The NDAA was crafted precisely to provide the legal mechanism for tasking the military to round up activists it conflates with al-Qaeda terrorists. 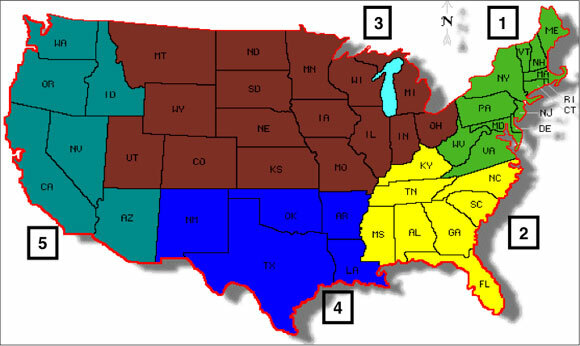 The plan was initially envisioned by Rex 84 and, in particular, Operation Garden Plot, an operational plan to use the Army, USAF, Navy, and Marine Corp. in direct support of civil disturbance control operations. It has since added numerous elements under the rubric of Continuity of Government, the overall war on terror, civil disturbance and emergency response. We are quite literally one terror event away from the plan going live. As the DHS and the establishment media keep telling us, the next terror event will be on American soil and not the work of al-Qaeda but domestic patriot political groups. The FBI has specialized in creating domestic terrorists – or rather patsies – and shifting the blame over to their political enemies.